While long-term care has been a pressing issue in Israel for some time, it assumed center stage in Israeli politics in recent weeks as the Ministry of Finance decided to abolish, as of Jan. 1st, 2018, the group insurance held by 1 million Israelis through their places of work. This action has exposed this group, in addition to 3.5 million other Israelis who have no private insurance, to under-coverage for long-term care. Earlier this year, a Taub Center research team -- Prof. Dov Chernichovsky, Dr. Avigdor Kaplan, Mr. Eitan Regev, and Prof. Yochanan Shtessman -- published a study on the state of long-term care in Israel. The study, which can be found here in Hebrew or here in English (abridged), concludes that long-term care in Israel is neither efficient nor equitable and sustainable due to a combination of fragmented entitlements and poor oversight, with heavy reliance on private finance. The research team proposed the establishment of a universal basic long-term care basket funded by mandatory contributions, and overseen by a single authority. Since the publication of the study in February 2017, Prof. Chernichovsky, who led the work on the basis of previous work, which can be found here, met with the Minister of Finance, Mr. M. Kahalon, the Minister of Welfare and Social Services, Mr. H. Katz, and Minister of Health, Rabbi Y. Litzman. In addition, Prof. Chernichovsky has had meetings with parliament member MK Itzik Shmuli, who is leading an initiative to establish universal long-term care. 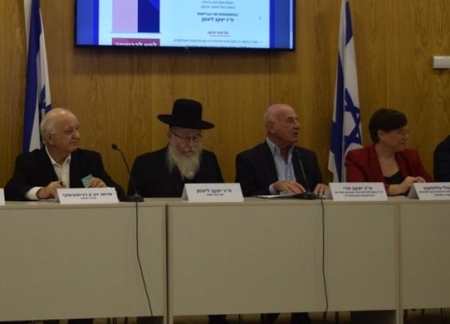 Prof. Chernichovsky was also invited by MK Yaakov Perry and MK David Amsalem to speak as an expert at the Knesset Caucus to Advance National Preparedness to Support the Aging Population. Following the caucus MK Tali Ploskov invited Prof. Chernichovsky to serve as an economic advisor to a Knesset sub-committee that she heads regarding elderly wellbeing. Prof. Chernichovsky has also appeared on Israeli television regarding this issue. The segment can be found here (Hebrew). For some additional background on the issue please follow this link to the Jerusalem Post article (English) from earlier this year, regarding the issue. תפישתו של האוצר את מנגנון השוק החופשי בתחום מערכת שירותי הרפואה, היא פשטנית במקרה הטוב. ב 1992, עת שימשתי שליח של הבנק העולמי לעניין מערכת שירותי הרפואה ברוסיה, הופגשתי עם מיכאיל דמיטרייב, כלכלן ממדרגה ראשונה, סגנו-עוזרו של השר לתכנון כלכלי (הכול יכול) של המעצמה המתחדשת. באותם ימים, לאחר נפילת החומות וכ 70 שנות שלטון סובייטי, קשה היה לשכנע כלכלנים רוסיים צעירים, משוחררים ונועזים, כמו מיכאיל, ששוק החופשי ואי מעורבות ציבורית אינם מפתחות לגן עדן כלכלי.